Amman releases statement condemning 'Israeli aggression' after Uri Ariel visits Judaism's holiest site. 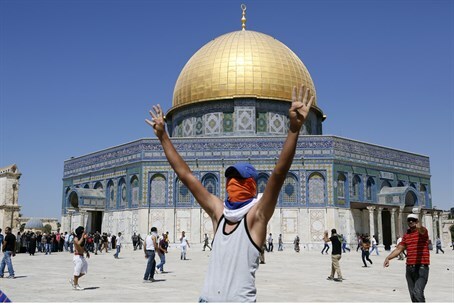 Jordan's Minister for Media Affairs, Mohammad Momani, strongly condemned Israeli "aggression" at the Temple Mount on Monday, 24 hours after Housing and Construction Minister Uri Ariel ascended the mount in a pre-planned visit to the Mount that was cut short by police. "These Israeli practices and violations, allowing extremist settlers to violate the sanctity of Al Aqsa Mosque under the protection of the Israeli police and army, will ignite violence and religious extremism in the region," he claimed, in a statement quoted on Jordan's state-run Petra news agency. He also urged the international community, mainly the UN, the Arab League, the Organization of Islamic Cooperation and international and humanitarian organizations, to pressure Israel over what he called "occupied holy sites" in Jerusalem. Ariel's visit was cut short by Waqf authorities on Sunday, despite the fact that it was heavily pre-planned. The Mount had been closed to visitors all day due to a bout of Muslim rioting at the site. "A reality in which rioters determine the day's agenda on the Temple Mount, and prevent Jewish visitors from ascending [to the Mount], is unacceptable," Ariel stated after the visit. "I went up to the Mount this morning, I intend to keep on doing so in the future, and I demand that security forces help keep Jewish sovereignty intact and allow any Jew to ascend to the Mount freely." Jordan recently threatened to revoke its 1994 peace treaty with Israel over a historic debate in the Knesset about providing full religious freedom at Judaism's holiest site. Under the peace treaty, Jordan controls Muslim holy sites in Jerusalem. The Temple Mount falls under this category, despite being Judaism's holiest site and the site of the two Jewish Temples, and the Muslim world has been adamant about keeping it in Muslim hands.